Our team is dedicated to preparing delicious, natural, fresh food for any gathering you can imagine. Whether social or work, for a few or a crowd, our menu is designed to provide a complete experience or complement your own creations.. Let us help you make a great impression, entertain with style & ease, or simply take the worry out of planning your next special occasion. Katie J�s is a locally owned Commercial Catering & Bakery Business operated by Katie & Patrick Moore & Staff. 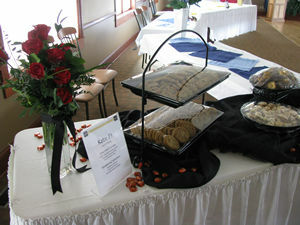 We offer a wide variety of services to cater any & all of your needs. We take same day orders & help you with any catering event large or small. From a boxed lunch to a full service gourmet buffet. 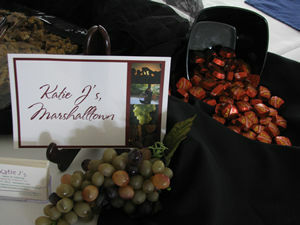 Katie J�s is NOT a home based operation, we are in fact a Commercial Catering Business. Our facility is State of Iowa Inspected, Licensed & Highly approved. Our front offices & lobby allow our clients to sit down in a professional atmosphere & arrange their special events. Katie & I thank you for stopping by our website & appreciate all of our customers interest. As always we enjoy taking care of your caterings / special events & look forward to your business in the near future. 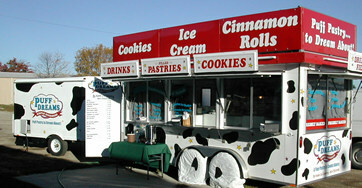 Katie J�s mobile concession unit allows for fresh baked Pastries, sandwiches, Salads, Pizza, cookies, brownies, Gourmet ice slushies & many other beverage & food items, to make your event a success. Mobile unit connects to 240v (or) is self equipped with a Quite Pac Generator. Works great for auctions & other events, where power is a problem.